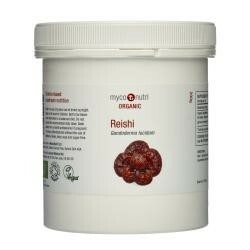 MycoNutri Organic Reishi therefore combines concentrated hot-water (polysaccharide-rich) and ethanolic (triterpene-rich) extracts of log-grown (Duan Wood) Ganoderma lucidum and is standardised to contain 15% beta-glucans and 4% triterpenes in order to deliver the full benefit of this most revered of mushrooms. MycoNutri products are manufactured in the U.K. to EC food standards and are suitable for vegetarians and vegans (capsules are of plant origin). No additives are used and the products are dairy, gluten, maize and soya-free. Soil Association certified organic.